After several months, the long wait of eager Aldub fans is finally about to end. “Imagine You & Me”, the second movie team-up of the Pambansang Bae, Alden Richards, and the Kalye-Serye Darling and Philippine’s “Queen of Dubsmash”, Maine Mendoza, will be finally seen in theaters in just a few days. This is really something historical since it is actually the phenomenal kalye-serye loveteam’s first time to lead in a movie. It can’t be denied though that the tremendous success of “My Bebe Love: #Kiligpamore” is credited to them, although the movie’s lead stars were Vic Sotto and Ai Ai delas Alas. “Imagine You & Me” is undoubtedly the most highly anticipated romantic comedy film of the year, produced by M-Zet TV Production, APT Entertainment, and GMA Films. It is basically all about a story of Gara (Maine Mendoza), a bubbly and spirited girl who goes to Italy to fulfill her dreams and at the same time, to find herself. There she meets Andrew (Alden Richards) who is undergoing some dramatic events in his life. Just like in most of the other rom-coms, Gara and Andrew eventually find themselves enjoying the company of each other until their respective life issues come in between them. Directed by Mike Tuviera, most of the scenes of this movie were shot in Italy. There are a number of new things about Philippines’ most phenomenal love team to watch out for in this exciting film as well. 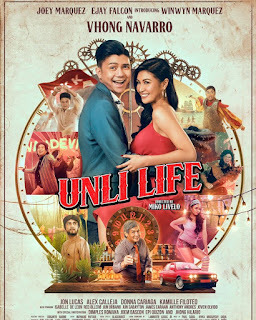 Other premier actors starring in this upcoming 2016 romantic comedy film include Jasmine Curtis-Smith, Yayo Aguila, Irma Adlawan, William Martinez, Luis Alandy, Cacai Bautista, Cai Cortez, Elijah Alejo, and Jerald Napoles. 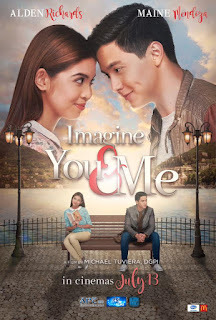 On July 13, 2016, three days before the 1st anniversary of Aldub, “Imagine You & Me” will be shown in theaters nationwide. This would indeed be a big celebration for all Kalye-serye fans all over the country.